Roy Travis Blankenship, son of Roy Lee Blankenship and Rena Mae Arnold and buried in McBee Cemetery, Ovalo, Taylor Co., Texas. Travis Blankenship, 76, died Sunday, April 29, 2001, at Scott & White Hospital in Temple after a long battle with lung disease. Services are 4:00 p.m. Wednesday, May 2, 2001, at Lawn Baptist Church with the Reverend Price Mathieson Officiating. Burial will be in McBee Cemetery directed by Fry-Bartlett Funeral Home in Tuscola. Mr. Blankenship was born to Roy Lee Blankenship and Rena Mae Arnold Blankenship in Lawn on July 19, 1924. 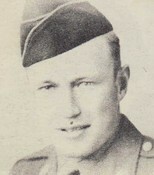 Travis served in World War Ii. After the war he worked in the oil business as a contract pumper for 50 years. He moved to Abilene in 1977 and to Temple in 1993. He will be remembered as being jolly, genuine and generous. Travis was preceded in death by his parents, Roy and Mae Blankenship; one brother, Durwood "Butch" Blankenship; one nephew, James Rickey Blankenship; and one great-nephew, James Andrew Blankenship. Survivors include three daughters, Kate Lawson of Austin, Nancy Hopperworth of Oklahoma, and Brenda Stirman of Lewisville; one son, Arnold Blankenship of North Carolina; two nephews, Nickey Blankenship of Caldwell and Danny Blankenship of Abilene; thirteen grandchildren and one great-grandson. Visitation will be today, (Tuesday, May 1, 2001) from 6-8 p.m. at the funeral home, Fry-Bartlett Funeral Home, Tuscola, Texas.